Bangkok Fight Lab are a proud certified affiliate of the Pedro Sauer Brazilian Jiu-Jitsu Association (www.pedrosauer.com). Master Pedro Sauer is a certified 8th Degree Red/Blackbelt under Grandmaster Helio Gracie (Co-Founder of Gracie Jiu-Jitsu) and Rickson Gracie. BJJ is a martial art, combat sport and self-defense system that focuses on grappling and especially ground fighting. BJJ was formed from Kodokan Judo ground fighting fundamentals that were taught to Carlos Gracie by Master Mitsuyo Maeda. BJJ eventually came to be its own art through the experimentations, practices and adaptation from the Judo knowledge of Carlos and Hélio Gracie, who passed their knowledge on to their extended family. BJJ promotes the concept that a smaller, weaker person can successfully defend against a bigger, stronger assailant by using proper technique, leverage and most notably, taking the fight to the ground, and then applying joint-locks and choke-holds to defeat the opponent. It is a physically demanding martial art, and new practitioners typically lose weight and gain muscle while improving coordination and flexibility. Practicing BJJ is also a great way to develop self-confidence and make friends with people from every background. Sparring (also called “rolling”) and live drilling play a major role in training, and a premium is placed on performance, especially in competition, to progress through the belt system from white, blue and purple, to brown and eventually black belt. Though competing is not a necessity in order to progress. 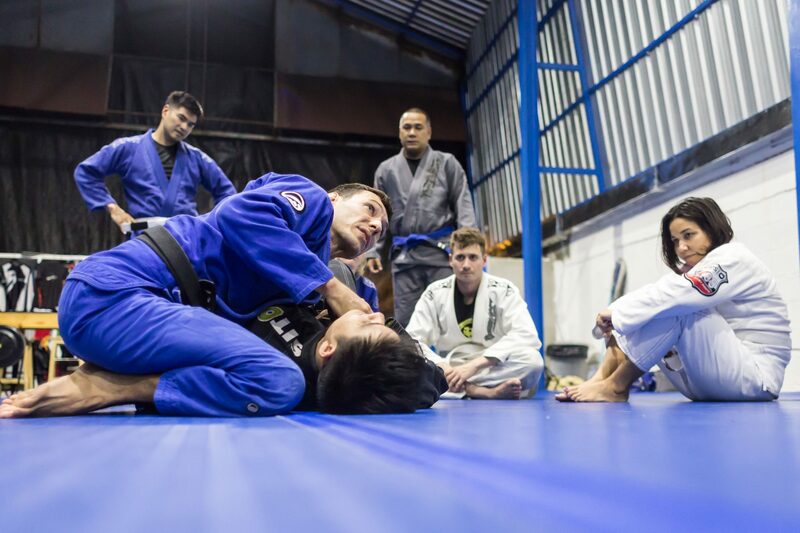 At Bangkok Fight Lab our BJJ classes are an hour long and involve a warm up, techniques, drills and positional sparring. 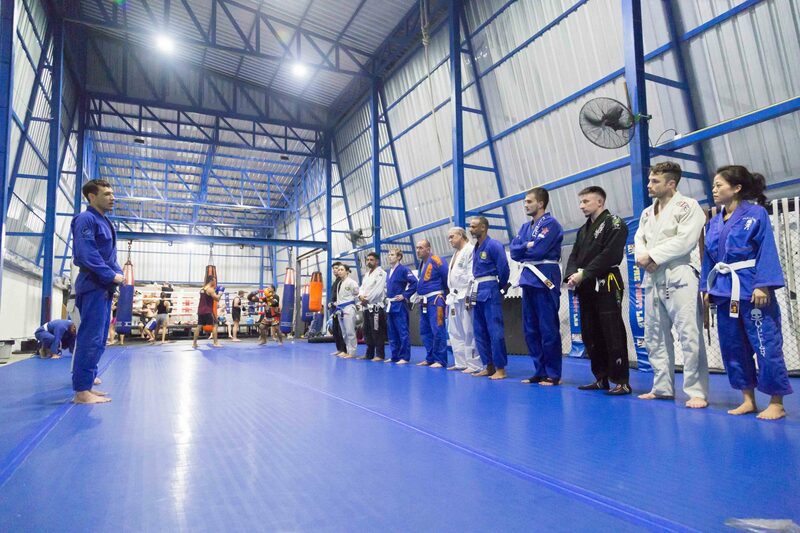 Every class is then followed by an optional open mat hour of sparring (rolling) where the techniques learned in class can be applied in a more live situation. 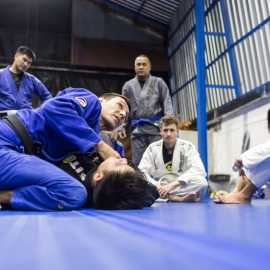 For BJJ in Bangkok, Bangkok Fight Lab is the place to go! We encourage children in Bangkok from the age of 6 to join our Juniors BJJ program. Classes are held 3 times a week and there is a growing number of competitions and tournaments held in Bangkok for all ages, should they be open to competing. 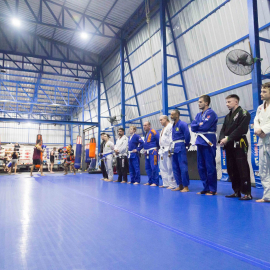 Regardless of competition, they will learn not only the physical aspects of Brazilian Jiu Jitsu but also discipline, respect for others and themselves, assertiveness, confidence and many other positive attributes to help with their development.